Samsung Kies and the GS5’s over-the-air (OTA) options are not detecting any update, so far. 1. The update is actually for your device and not for the same device supported by another carrier. 2. The update is temporarily not available on the Samsung Kies update service or OTA service. 3. Your device does not have the original version of Android operating system. This typically occurs after rooting the device. A. Check the software update information on the official Samsung website and make sure it is related to your specific device. 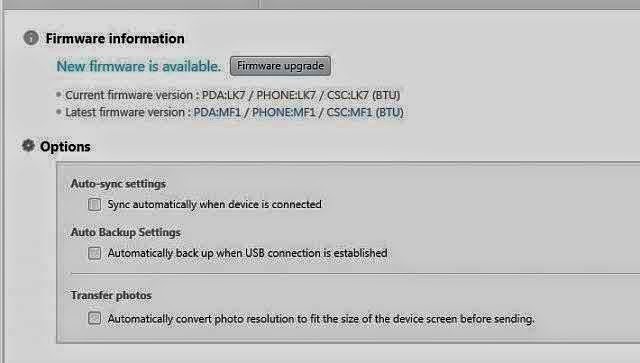 If necessary, please check the Android platform version of your device to see software/firmware compatibility. The first five to six digits of the software version must match the information found on your device's BaseBand version. B. Updates from both Kies and the device's OTA service may not always become immediately available for certain devices. There are times when the firmware update is already offered but it is not yet available for your device until sometime later. In this regard, please try to check for your GS5's firmware updates at a later time. Some carriers would require your device to have an active SIM card installed to be able to connect your carrier's wireless network so as to access the OTA update. Try to verify with your carrier on this matter. In case you have rooted your device, you may need to restore the latest Android OS version that was specifically designed for your device model/version in order for the firmware update to go through.